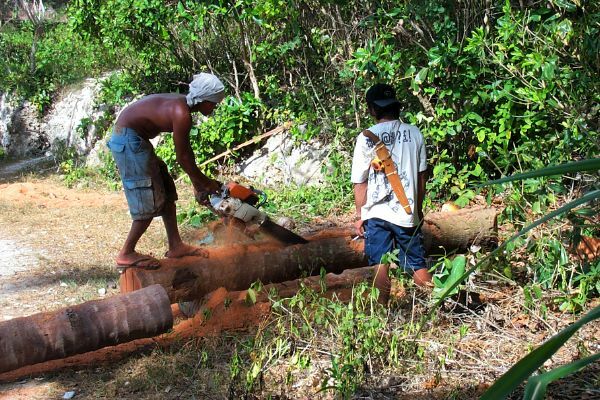 Milling coconut tree lumber with a chain saw. Can you count the safety violations? No hearing protection (should wear ear plugs or muffs). No eye protection (goggles, face shield, or safety glasses with side shields). No leg protection (chain saw chaps). No foot protection (safety shoes or boots). No anti-kickback device on the chain saw. Using the tip of the saw to cut into the log (not shown in this photo). Unstable work platform (standing on the log). The helper is smoking a cigarette near combustible sawdust.